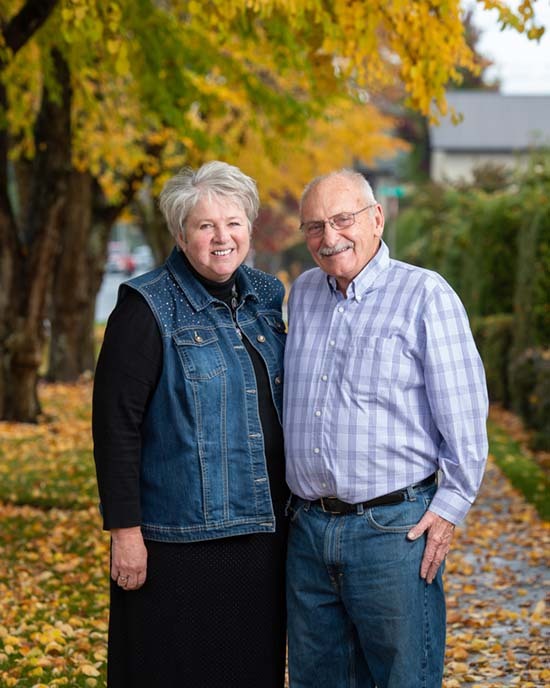 Profiles of People: "A working love"
Lynda and Rick Condon outside in Snohomish as autumn’s leaves spread in the background. The couple married 50 years ago. SNOHOMISH — Lynda and Rick Condon have been married 50 years plus a little over one month the day of this story. Of course 50 some years ago it wasn’t that simple. They did live close to each other in a small Wisconsin town, but he was older and had lived as a child with polio. Rick thinks maybe he was five when he reached up to turn off a porch light. His right leg would not move. Childhood polio had just changed his life forever. No more running and jumping. His mother recognized this slayer of children immediately and ran to the neighboring farm. The rural doctor rushed from 8 miles away to their home. Two choices were given the little boy: heart surgery to repair the tear in his heart; or years of restricting his activity. His parents chose the latter, so much of Rick’s childhood was spent walking, never running. Eventually the weakness in his leg disappeared and at 18 he signed up for the Air Force. He wanted the “free” schooling the military could offer. The Air Force gave him a physical, but at that time Rick didn’t elaborate about his real medical condition, as this was the middle of the Vietnam War young men were needed badly. He spent the war testing missile guidance systems in Michigan. Meanwhile, back on another farm Lynda was 16 and helping raise her seven younger brothers and sisters. She also attended school, but Rick and Lynda never attended school together so they’d never met. Lynda’s life was filled with laughter, work and sharing all the things large active families share on a working dairy farm. There were always freshly baked cookies on the table when she came home from school and she would gather eggs. Her parents are still doing well right where she left them. In fact she flew back to see them in September, where she and Rick went to Lynda’s high school reunion. They got to see her best friend who changed Lynda’s destiny when at 16 her friend set Lynda up on a blind date with Rick. The rest, as they say, is history. managed to buy a home and a motor home. They traveled with the children and raised them the best they knew how. Family and faith to them is all important. For Rick, joining Lynda’s enormous raucous tribe meant the world. He had always wanted a big family and sees her relatives as a great blessing in his life. of community and give back. Even today they both work to have a few extras, travel and be more comfortable than pensions and retirement plans allow. They enjoy the simple pleasure that comes with sharing the past, the present and the future with someone who has the same history, values and love. They find comfort and are comfortable with each other as they live each day and make plans for each tomorrow. Money can’t buy what they have built. She worked for the railroad as a key punch operator. Then she became a horticulturist expert through higher education. He was an electrician for the telephone company. He loves working with his hands and still takes paid positions so he can create things. She loves bulbs and still loves selling and teaching about them. These parts of their lives they do separately, but when they come back home at night it is to the same home. They get to share their day and their adventures of the day, together. They share ideas, memories, aches, pains, wins, losses, fears, joys — together.